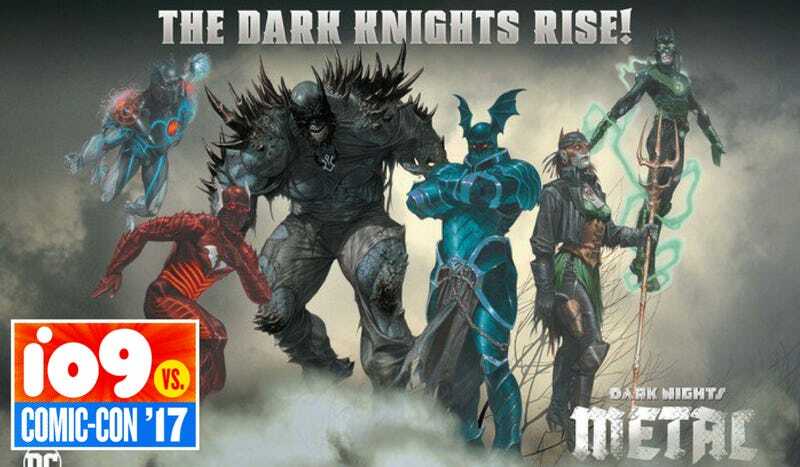 Between a series cryptic teaser images and an even more difficult to parse prelude comic, we knew that DC’s upcoming Dark Nights: Metal series was going to involve dark, alternate reality versions of the Justice League. But we had no idea they would all be quite this twisted—or that they were all going to be half Batman. From left to right: The Murder Machine (Cyborg); the Red Death (The Flash); the Devastator (Doomsday); the Merciless (Wonder Woman); the Drowned (Aquaman/Mera); and the Dawnbreaker (Green Lantern). Not pictured: The Batman Who Laughs (the Joker, of course). The proof is in the chest logos, as they say. Few details about writer Scott Snyder and artist Greg Capullo’s massive event storyline have been revealed thus far, but each member besides the Devastator and the Bat Who Laughs will have their own #1 coming out in September or October. The Dark Nights: Metal series, however, begins in August.